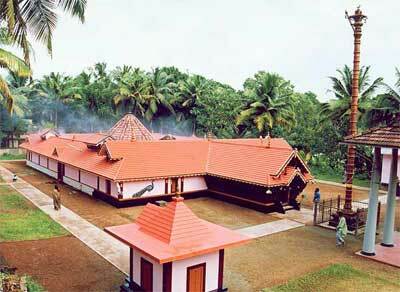 Thazhakara Śrī Subrahmanya Swami Temple is located in Mavelikara Taluk of Kerala, which is central part of erstwhile Travancore region. The temple has been in existence for over a thousand years. In the early times, the temple was under the management of Edapally Elangur Swarupam. The diety "Shadadhara Parathishta" of Lord Murugan here assumes a human form holding a spig of paddy and fire (torch) in his hands. The Lord carrying sprig of paddy is interpreted as the custodian of wealth. Only recently, the temple has undergone several physical and spiritual renovations. It has attained the aura of a great temple. There is massive increase in number of pilgrims. The tide of devotees on Shashti days is an evidence for this. The temple stands as a symbol of cultural heritage, communal harmony and prosperity of the region. It is surrounded by rich greenery. The temple can be accessed by road and rail. Lodging and other facilities are available in nearby places. Nearest railway station is Mavelikara. The temple is under the administrative control of ‘Haindava Seva Samithi', a body registered under the 12th Travancore-Cochin Literary Science Charitable Act of 1955.